Jack Dorsey, one of the brains behind popular micro-blogging site Twitter, is selling a new product called Square that turns your iPhone into a credit card payment system. Unlike similar iPhone applications, Square includes not only the payment software, but a magnetic card reader that allows you to swipe cards instead of manually inputting credit card numbers. The payment system is designed for any type of business owner including storefront owners, street vendors, and even part-time flea market salespeople. Square is a little plastic magnetic card reader that hooks into the headphone jack of your iPhone or iPod Touch. When you swipe a credit card through the device, it converts the card information into an audio signal, which is then processed by Square's software application on the device, according to GigaOm. Then, the card information is encrypted and transmitted to Square's servers via a Wi-Fi or 3G connection for processing. Dorsey says your credit card information is never stored on Square-enabled devices. 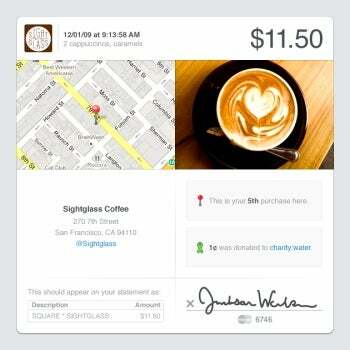 Once the transaction is approved, you sign for the purchase on the iPhone screen using your finger. Your receipt can then be e-mailed to you or sent via SMS. But it's not actually a receipt. What you get instead is a link to a private page on Square's Website where you can view and save your receipt, according to TechCrunch. Square isn't just for store owners; the device is small enough to fit on your keychain and could be used by anyone who wants to accept credit card payments. That sounds like a real advantage, especially for someone who runs a weekend business for extra money. But I'm doubtful this system is practical for everyone. For example, TechCrunch has a demonstration video of Square in action at Sightglass Coffee in San Francsico (Dorsey is an investor in this cafe according to TechCrunch). The process for buying, while not particularly long, just has two many steps for a grab-and-go product like coffee. Especially considering that larger chains like Starbucks can get you through the line faster since they don't require your signature at all. However, for purchases at flower vendors or hot dog stands where there simply wasn't a plastic payment option before, Square is an ideal solution. Right now, Square only works with the iPhone or iPod Touch; however, the company's Job postings list positions for Android and Blackberry Client Engineers, so it's clear which mobile phones Square has its sights on next. Square is not the only company to come up with a mobile credit card solution. Apple's App Store has over twenty applications that allow you to pay with your plastic by manually inputting credit card information. That's where Square is different: not only does it offer the credit card payment services, but it offers a mobile magnetic stripe reader as well. Square doesn't have a formal process for purchasing its service yet, but if you are interested in Square for your business there is an email submission form at the bottom of Square's Website . As far as cost goes, no one has attached an official price tag to Square's service, but Dorsey told the LA Times that the magnetic card reader may be given away for free.